Gerry Gold, author of A House of Cards, reviews Squeezed, America as the Bubble Bursts by film maker and media activist Danny Schechter and suggests it’s time for a new American revolution. 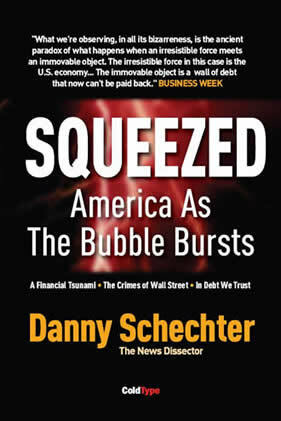 As award-winning film maker, and media activist Danny Schechter was fighting for attention for In Debt We Trust, his exposé of the US debt crisis as a bubble likely to burst, his predictions began to be fulfilled as the subprime crisis erupted into the public eye. Since then, the process has spread from the mayhem in the subprime mortgage arena to global financial turmoil and the onset of recession. In Squeezed, America as the Bubble Bursts, his follow-up 180-page free-to-download instant book, Schechter collects together his blogs and other material to get beneath the surface of the bursting bubble of credit and debt as its explosive impact blows the house of cards down. Part critique of the media, part assault on the conspiracy of silence amongst bankers, credit card companies and politicians, Schechter is at once passionate, informative and hugely entertaining. He is especially savage in his attack on the right-wing, image-dominated Fox Business news channel. Schechter also points a sharp finger at his colleagues in the mainstream media, asking: How did we miss the signs of an impending crisis? Why did the markets and the media downplay the sub-prime menace? His critique pulls no punches, showing how the media conspired to bury advance warnings - as early as 2004 - of the growth of unsustainable debt and how they ignored the emerging crisis, or consigned it to the depths of the financial pages in an alphabet soup of impenetrable jargon understood only by specialists. When a firestorm swept through California in October 2007, news media gave wall-to-wall coverage to a disaster which, in the end destroyed around 2,000 homes and cost $1 billion. The financial crisis, in which millions are threatened with the loss of their homes and is costing trillions of dollars is largely hidden behind arcane, complex analyses on the business pages concerned with losses to banks and shareholders. “The political crisis engages the bashing brigade of message point polemicists on the right and left who both tend to ignore economic interests. They are the forces that are devastating the lives of so many Americans who have lost their jobs, can’t pay their bills and are victimized by the growing inequality in our nation which does not seem to have become a political issue yet. No one’s marching on the banks or Wall Street to demand economic justice. “Think of all the soldiers who join the military because the pay is better or they have no other choice. Think of all the poor Iraqis being killed by poor Americans who return to find themselves going even more deeply in debt. They are the ones being victimized by payday lenders whose signs advertising easy money line the boulevards outside military bases. Speak to military families and you will find that their lives are harder than ever. On the investigative journalist’s trail of finding someone to blame for the mess, we’re taken through student debt, behind the loosening of regulation of mortgage lending to the new background finance houses that transformed the role of lenders from careful prudence to predatory pressure selling and on to the Devil’s lair in the all-pervasive greed on Wall Street. What we find is a story of the collective failure of individuals and a failure of regulation opening up opportunities for the greedy operators at the heart of the economy to sucker the helpless weak. Schechter is absolutely right to expose the frauds, scams and criminality at the heart of the capitalist market system. Apart from exposing these kinds of people and agencies, we also need to understand the even deeper logic of the system that’s brought the world to a crisis bigger and more threatening than 1929 and its aftermath of fascism and war. Schechter asks how society could “contain, restrain and block” the credit and loan complex to call a halt to “the institutional rip-offs coming to light in this subcrime scandal”. Later in his book, in a section entitled “Debt as a Global Issue” Schechter asks, “is it America that is to blame or is it our globalized and hyper-charged capitalist system controlled by a small number of financial institutions?” The answer is to be found in the second option. Capital was obliged to expand, to try and overcome the limitations of post-war trading and financial arrangements. Credit and debt had to explode to feed the beast of profit. All of this was actually necessary to transform American companies into transnational corporations which could then transfer manufacturing jobs to lower-wage, lower-cost areas of the world. All forms of containment, restraint, blocking or regulation were swept aside in the neo-con, free-market liberalisation process dubbed globalisation. You can’t put the genie back in the bottle. If the global crisis teaches us anything, it’s that nobody, and least of all the financial institutions, controls the global financial markets. These operate according to the laws of an economic system which is beyond control or regulation. As we have noted, regulations were dismantled precisely because profit-driven economic growth depended on massively inflationary expansion of credit to feed production in the newly expanding economies in Asia and Latin America and the consumption of the commodities they produced by Americans and others. Schechter is absolutely right to demand, in the spirit of Shays, a “militant campaign for economic justice”. But there is an urgent need today to aspire to more than tougher regulations of the financial monsters that now rule our lives in a bid to “end their predatory practices”. Shays was a revolutionary whose rebellion inspired ordinary farmers but alarmed George Washington and others. These leaders of the revolt against British rule went on to develop a state system that would better protect nascent American capitalism than the existing confederation was able to do. The challenge in the 21st century is to create the conditions for a new American revolution alongside revolutions in Europe, which go beyond the democratic achievements of the 18th and 19th centuries. These should have as their objective the termination of the power of private property over human rights through the co-ownership and self-management of corporations and the socialisation of financial institutions. That would be the most appropriate way to deliver the economic justice that people like Schechter campaign for so tirelessly. There has been a huge international fraud committed against the people of this planet. It is unprecedented and make no mistake there will be millions of losers. Many of those will be good, honest, hard working folk who've tried their best to stand on their own two feet. Many now find themselves without money or a home. As we survey the political and economic carnage around us there is one aspect that needs explaining. Why aren't those who have committed this fraud been brought to trial ? Their crimes are simple, rank incompetence, absence of due diligence, sheer greed and fraud. In the process they have escaped with hundreds of $millions while leaving a human trail of destruction that will lead to extreme hardship being inflicted on people who didn't deserve this. We, the people of this planet, want justice and we want to see the perpetrators of the global economic implosion being served with prison sentences. In the process let's see their wives and children reduced to the level of paupers and see just how funny they find this unfolding disaster. For now the elite club, those "masters of the universe financiers" who smugly think they've got away with it, are arrogantly enjoying the trappings of their fraud. The global tide of opinion will turn however and an uprising on a scale never before witnessed could bring about street justice.